Since I just reviewed Ratchet & Clank Future: A Crack in Time, why not move on to the next Ratchet and Clank game that was recently released? I really wasn’t expecting Insomniac, the company behind the franchise, to go back to the game’s action platforming roots due to the little experimentation they were doing with other genres. 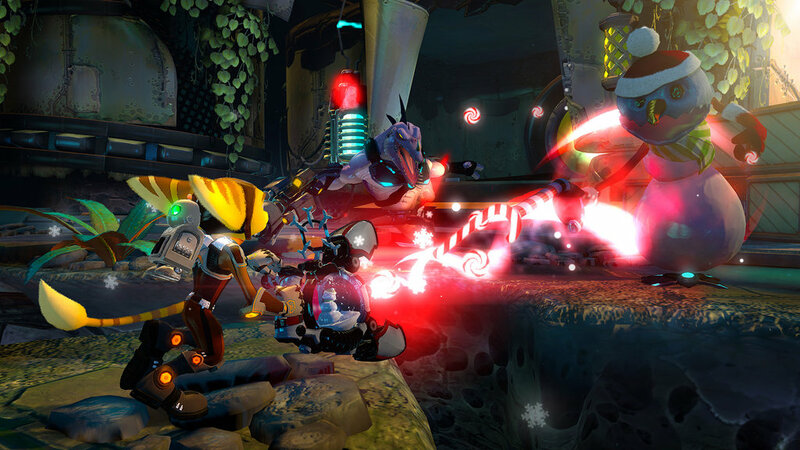 So, where does Ratchet & Clank: Into the Nexus stand? I have already said my favorite game is A Crack in Time, and I honestly didn’t know what do expect with this game. It was announced only a few months ago, and I wasn’t sure how excited people were going to be about it. I mean, I am always up for another action platformer from Insomniac, but they have been busy, and are still busy with games like Fuse and the upcoming Sunset Overdrive. So, how does this game turn out? Was returning to its roots a good idea? Or should they experiment a little more with other genres? Read on to find out! James Arnold Taylor and David Kaye Return as Ratchet and Clank respectively as this game’s story takes place after Ratchet & Clank Future: A Crack in Time. 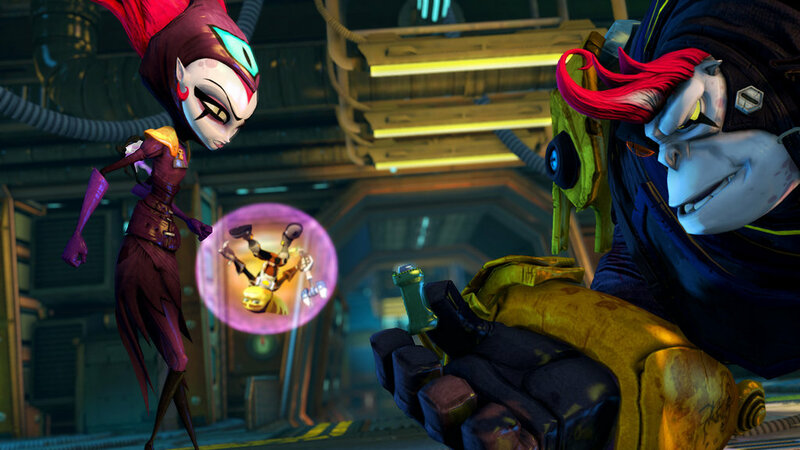 Ratchet is escorting a dangerous prisoner known as Vendra Prog, voiced by Nika Futterman. While he is doing some repairs on the ship and getting ready to wake up Vendra, Vendra’s brother, Neftin Prog, voiced by Fred Tatasciore, has hired a bunch of thugs from Thugs-4-Less to get his sister back. Neftin’s plan to get his sister back works well, and results in the prison ship she was on getting destroyed. On top of that, the destruction of the ship results in Ratchet losing two friends. 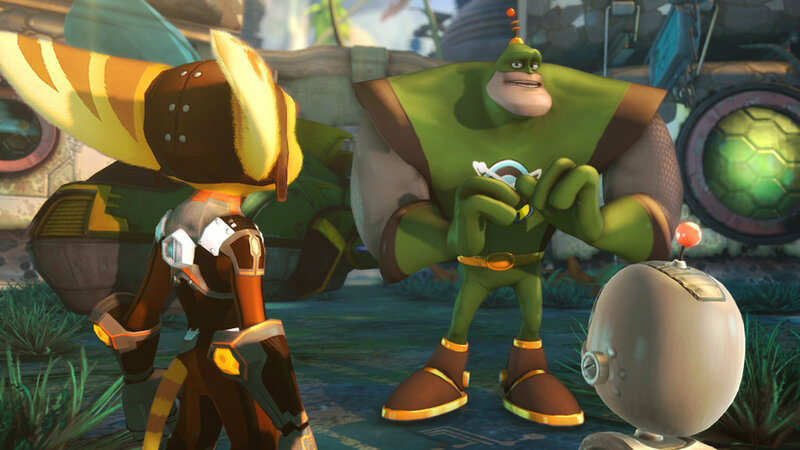 It is up to Ratchet and Clank to catch up to Vendra and Neftin to find out what their plan is, and save the galaxy. At first, I just thought the story was solid. There wasn’t really anything too grand and epic as A Crack in Time, but after thinking about the story a little more, I enjoyed it! I enjoyed the two villains, Vendra and Neftin, and their plight is understandable. I really like Neftin’s side of the story. He knows that his sister can be an incredibly difficult person to be around, but he follows her commands anyway since he wants to make sure she will be okay in the end. Luckily, both Vendra and Neftin work well off each other. While I did enjoy the story, I will explain my issues with it later on in the review. If you have played any of the PlayStation 2 or PlayStation 3 games in the series, this game should be no different. 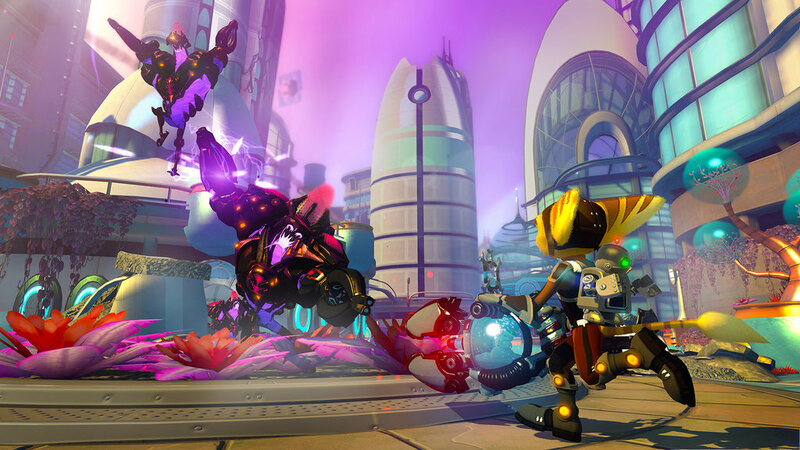 This time, you will be able to have both Ratchet and Clank the whole time, instead of the previous game where you were both characters during certain parts of the game. The gameplay for the most part hasn’t changed. You will be running and gunning your way through different planets, while fending off enemies and, from time to time, a boss character. The weapons are a mix of standard weapons used in the past, and some new weapons, like a gun that turns enemies into snowmen, are added into the mix. There are some fun platforming mechanics using the gravity boots and a gun that shoots gravity streams. 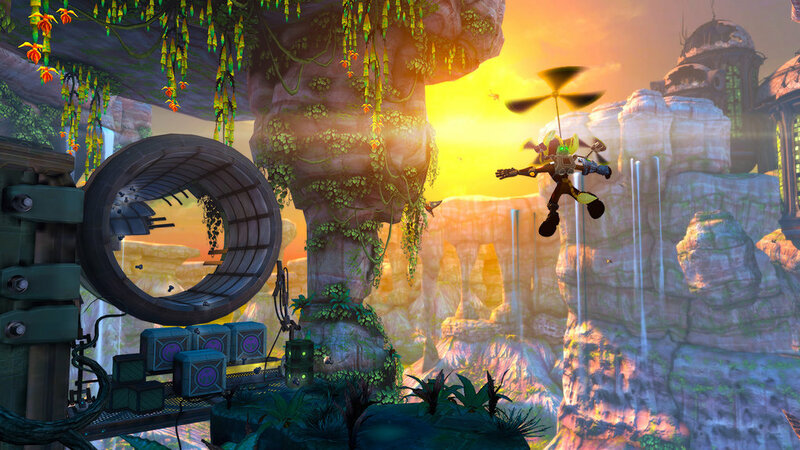 The only difference with the gameplay is the sections where you are in the netherverse with Clank and must find an eel-like creature to bring back to the beginning of the platforming level. It reminds me of something from Super Mario Galaxy. Outside of the main levels, you will have a challenge arena to go through, and some side quests from your friendly smuggler. The overall game is five hours long and there is a harder difficulty mode that you can play where you can keep all your upgrades. Other than that, there really isn’t much else to the overall package. The game looks pretty good for using the same engine used in the past PlayStation 3 games. The art style has gone back to the style used in Tools of Destruction and A Crack in Time. It is still nice, colorful, and well animated. I think some of the best looking moments within the game are the levels that you go through with Clank. It is a great contrast with Clank being pure black colored and going through a stage that has vibrant blue and purplish pink crystals. It just looks great, and makes you feel like you are in another dimension. The voice work is fantastic. Once again, all of the characters have strong voice actors. The only thing that kind of bugs me is that they changed out one of the character’s voice actress with another. The character of Talwyn Apogee is voiced by Ali Hillis instead of Tara Strong. Ali Hillis, for those not in the know, is the voice actress for Liara T’Soni from the Mass Effect franchise, Sofia Hendrick from Gears of War: Judgment, and Lightning from the Final Fantasy XIII games. She isn’t bad, but it is noticeable when you realize that the voice coming out of the character is different than the original. It is like when you watch the first Aladdin movie and hear Robin Williams’ voice come out of the Genie, and then watch the straight-to-video sequel and hear Dan Castellaneta’s Homer Simpson voice. It is a little jarring. Michael Bross is the composer for the game and the music is fine. It isn’t anything too different from the previous games, but it is fun to listen to. So, what is wrong with this game? For once, the short length of the game hurts the story. While I did enjoy it, the five hours that it takes to beat the game doesn’t give it a lot of time to flesh out a whole lot of the main big bad guy’s backstory. On top of that little topic, the main big bad guy that Neftin and Vendra help is totally forgettable. There is nothing unique about him and that is what is such a bummer about this game. What happened here? This franchise is known for having such memorable villains, from Dr. Nefarious to Gleeman Vox, and yet, this big monster guy isn’t anything that unique or special. I like Vendra and Neftin, but even then, their story of why they are helping the big bad guy is very predictable. This results in the big plot twist not being so big. I would have liked some kind of twist like we saw in Up your Arsenal or A Crack in Time. For example, the big bad guy could be Emperor Percival Tachyon who has morphed or mutated from being within another dimension for so long. That would have been a great twist because no one would have seen that coming. The short length also hurts the space exploration, because there is none. That was one of the best features of A Crack in Time, where you could fly around freely in space in little galaxy overworlds. They could have fleshed that out more and made something unique. Again, I didn’t really care for the fact they changed one character’s voice actor. I know they did this before with Ratchet’s voice actor not originally being James Arnold Taylor, but this bugs me. In the end, I do like this game. I like the small improvements to the overall gameplay, the story, music, and voice acting. However, I do feel like they were kind of rushed to make this game, and while it is a well-designed game and I could recommend getting it at its current price tag, I hope they take their time with the next game and give us the ultimate experience. Even though the story does feel slightly rushed due to the five hour length, the ending is actually not that bad. The game right now is $40 and I was lucky to get my copy for half the price. You also get a download code for the downloadable Quest for Booty entry in the franchise. 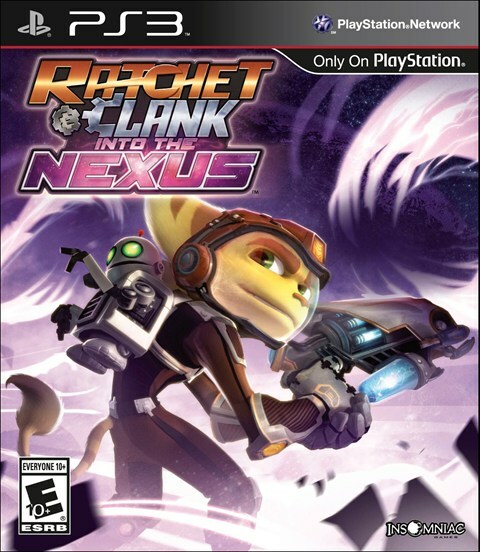 A Crack in Time is still my favorite Ratchet and Clank game, but Into the Nexus is right up there within my top five favorite games in the Ratchet and Clank franchise.